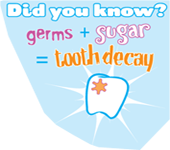 Tooth decay is an infection. Your baby has 20 little teeth growing under the gums. Start good habits now. Clean your baby’s gums with a clean, damp washcloth after feeding and at bedtime to wipe away germs and sugar. Sugar is in many foods and drinks including breast milk, formula, baby food, and juice. Putting your baby to bed with a bottle of anything other than water coats the mouth and teeth in sugar. Don’t feed tooth decay — Don’t put your baby to bed with a bottle — Don’t dip pacifiers into sugar or honey! Fluoride helps to stop tooth decay. Ask your baby’s doctor if your child needs fluoride to help protect teeth. Teething babies may have sore and tender gums. Rub the gums with a clean finger, small cool spoon, or teething ring. Diarrhea and fever may not be a part of teething — call your child’s doctor. The front teeth come in first. Clean your baby’s teeth after feeding at least two times daily with a small, soft toothbrush, pinhead amount of toothpaste, and water. Your dentist or doctor can show you how. Remember, don’t pass germs — don’t share a toothbrush. Begin giving your baby a cup for drinking. Avoid sweet drinks and limit drinking (other than water) between meals. Drinks (other than water) in sippy cups coat the mouth and teeth in sugar, feeding tooth decay. Limit juice to one cup or less a day. Healthy teeth are all one color. If you see any white or brown spots or stains on your child’s teeth see a dentist right away. Healthy food = Healthy teeth. Feed your child snacks low in sugar like cheese, yogurt, peanut butter, and vegetables. Children ages 1-5 need three cups of milk per day. Protect your child’s teeth from injury. Do not let your child run with anything in the mouth. Prevent injury from falls. Teach your child the right way to use climbing toys. Have your child wear a helmet with riding toys and always buckle up in a safety seat riding in the car. Make an appointment for your child to see the dentist. This visit is like a well baby check for your child’s baby teeth. Baby teeth continue to come in through age three. Wean your child from the baby bottle if it is still being used. Begin using a pea size dab of fluoride toothpaste when brushing your child’s teeth. Teach your child to spit out the toothpaste — don’t swallow. You will need to help your child brush until they are about age 8. When two teeth touch, you may begin flossing your child’s teeth. Continue the good habits you have started for your child’s healthy teeth. If your child still uses a pacifier, discourage its use after age 3. 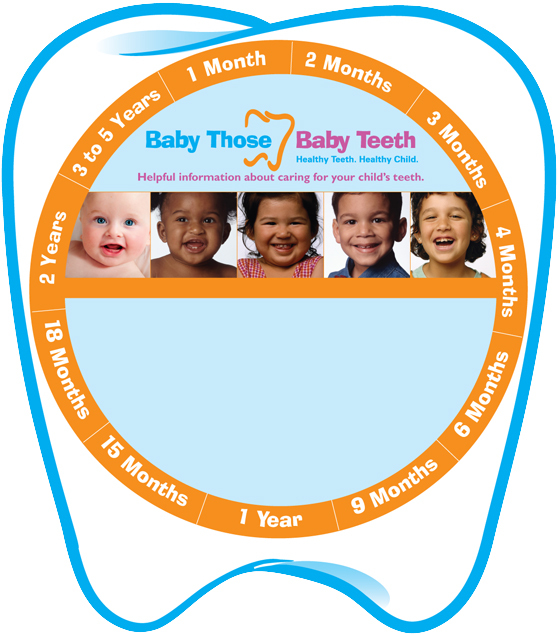 Baby teeth begin to loosen around ages 5 or 6. Thanks to you, your child is on the way to a life long bright and healthy smile!